Mayans lived in well-planned cities and urban centres where the housing was well-organized. Typically, Mayan cities had two kinds of housing. One of these was reserved for the nobles and the royalty, and comprised of palaces or huge stone constructions set up with decorative features. The other type of housing was for the commoners. Commoner houses were usually huts with thatched roofs, centred on a small personal garden owned by each family. The houses of the same extended family clustered together in the Mayan society. 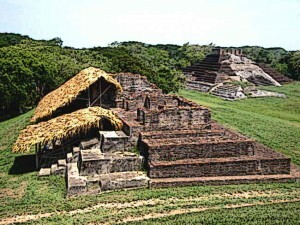 The commoners in the Mayan society usually lived in huts. Every family had a single hut as its residence. The hut had a thatched roof and didn’t have any interior partitions. All the family members slept in the same single-room space of the hut. Members of the extended family lived next to each other. For instance, the married son of a Mayan would construct his home next to his father’s hut. Such extended families shared a common kitchen garden where they grew their fruits and vegetables. All the houses in a typical Mayan nuclear family also shared storage space and a cooking area. In a Mayan city, each commoner demarcated his own “plot”. Such a piece of land was marked by the construction of a solid, low wall all around it. All the material possessions of a given Mayan commoner family existed within this land, including the houses of the same family. The space included the housing structures, or huts, a garden, a cemetery, a laundry room, latrine and storage space. Most of the features were shared by the members of an extended family. The commoners generally buried their ancestors under the floor of the house, or right next to it in a separate cemetery. The kitchen area usually comprised of a fire pit situated right next to a hut where the food was prepared. In some commoner houses, hammocks were strung outside the houses and used as beds if the weather was favourable enough. Mayans lived in well-planned cities and urban centres where the housing was well-organized. Commoners in the Mayan society had access only to the essentials of life. So they had to make use of inexpensive materials in constructing their houses. A typical commoner house was constructed in the shape of a hut. Its upper structure made use of a number of wooden beams. The walls were made of packed clay which helped save the family inside from heat and cold during all seasons. Stone foundations were used in some houses although most commoner houses didn’t have them. The beam-structure forming the skeleton of the top of the house was covered with grass or tree branches which helped avoid any rain fall from entering the house. Although the elites had a lot better houses, they followed similar customs as the commoners. For instance, elite families of the Mayan nobility also lived in the style of a nuclear family. Members of the extended family would build their houses around a common plaza, living next to each other, although every new family member constructed a new house after his marriage. The houses of the elite also served as status symbols, differentiating them from the commoner houses by their construction and outlook. The houses of the Mayan elite were constructed in such a way as to ensure durability. They were usually made up of stone and vaulted masonry was used to make their structure stronger. The use of masonry ensured that the houses weren’t damaged in adverse weather or during enemy attacks. It also made sure that they weren’t prone to accidents such as burning down, a hazard which was frequent in commoner houses. These houses were usually on top of raised platforms, which was another way of differentiating them from the houses of the commoners. Since the elite could afford to have intricate tombs constructed for their deceased, they didn’t follow the custom of burying their ancestor under house floors. Limestone was the most common kind of construction material that was used in propping up the houses of the elite. Most Mayan cities had limestone quarries situated close to them. Large piece of limestone were transported to the city where they were chipped, flaked and smoothened. They were then used in the construction of the houses. Another important material used in the construction of these houses was the mortar. Mayans made their mortar by treating the limestone in a chemical process. This mortar was very strong and can be regarded as one of the major reasons why a lot of the Mayan architecture stands tall to this day. Like the construction and the outlook of Mayan houses, their interior also reflected the social station of the owner. In the houses of the commoners, for instance, the beds were lined in single-roomed interior of the house. These beds were made of mats and reeds, and cotton blankets were used during winters. Different rudimentary forms of pottery also existed in commoner houses, being used in cooking and eating. The houses of the elite were more elaborately decorated, being far more spacious than commoner houses. The elite owned not only pottery as part of the household items but also different kinds of art works. Mayan cities were built with well-organized housing. The houses of the commoners and the nobility were built in different parts of a city. The nobility were situated near the main plaza of the city where the palaces of the royalty were located. The houses of the nobility had stone constructions with elaborate external decorations in the forms of carvings. The interior of these houses was also furnished with different works of art and pottery items. Commoners lived in huts with thatched roofs which were poorly furnished and not very spacious. Extended families lived together in nuclear family units so that their houses were situated right next to each other. In commoner families, this also meant sharing kitchen areas, storage space and a cemetery.